‘Dreams are made from here, Ancient energy is near, So much spirit, So much soul, Take my hand, Come walk with me…’ Robb Binks dedicated her song ‘Dreams’ to Bylong. If you allow the land to touch you, these words can be applied to any landscape. Near Gulgong a small remnant of Box Gum Gassy Woodland has touched me. Adams Lead Reserve is a crown land reserve on Goolma Road, on the Western edge of town. The traditional owners of the land are the Wiradjuri people. For many generations as they walked the land, it is understood they would have gathered food under the shade of the Yellow Box trees. The Gulgong district was part of the indigenous trading route from the coast to inland Australia and there is evidence of significant Wiradjuri cultural connection to the general area. When you visit the Reserve why not sit quietly and feel the spirit from the past, in the present. Adams Lead Reserve has great ecological importance. It contains a small, mature remnant of Grassy Box Woodland. This vegetation community consists of the association of White Box (Eucalyptus albens), Yellow Box (Eucalyptus melliodora) and Blakely’s Red Gum (Eucalyptus blakelyi) and native grasses. 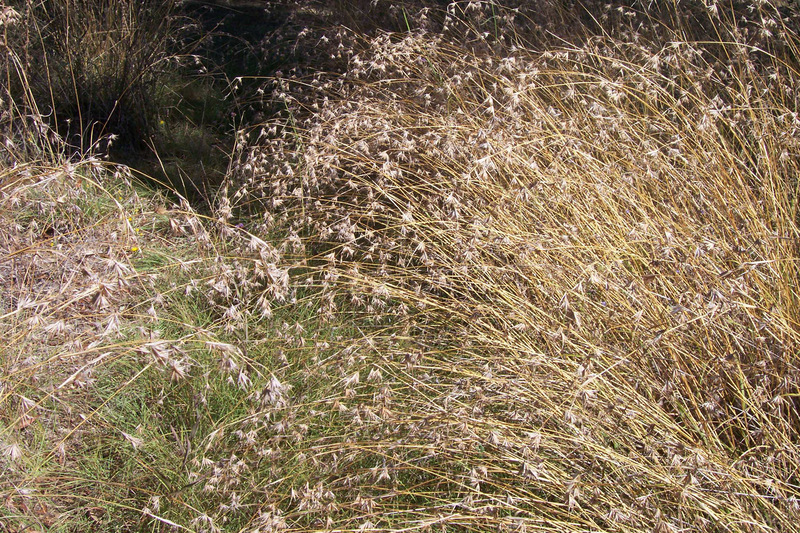 Grass and herbaceous species generally characterise the ground layer. Shrubs are generally sparse or absent. Grassy Box Woodland is a Critically Endangered ecological community under the Environment Protection and Biodiversity Conservation Act 1999 (National) and as an endangered ecological community under the Threatened Species Conservation Act 1995 (New South Wales). Walk slowly and let your eyes take in all the detail, and feel the peace and beauty. The Reserve contains the first lead to be mined on the Gulgong goldfield rising on the western slope of Red Hill. It has remnants of old shafts and mullock heaps which give Adams Lead considerable historic value. Reflect on the history and how much has occurred on this site.